Since his first published story, "Apartness," appeared in 1965, Vernor Vinge has forged a unique and awe-inspiring career in science fiction as his work has grown and matured. He is now one of the most celebrated science fiction writers in the field , having won the field's top award, the Hugo, for each of his last two novels. Now, for the first time, this illustrious author gathers all his short fiction into a single volume. 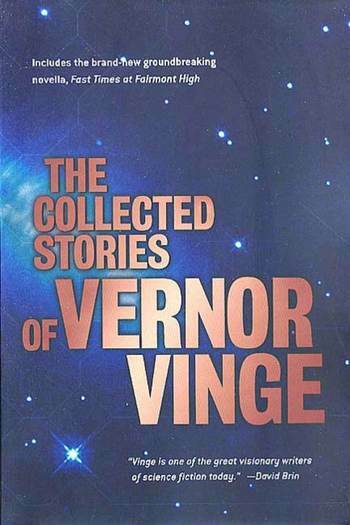 This collection is truly the definitive Vinge, capturing his visionary ideas at their very best. It also contains a never-before-published novella, one that represents precisely what this collection encapsulates--bold, unique, challenging science fictional ideas brought to vivid life with compelling storytelling. Including such major pieces as "The Ungoverned" and "The Blabber," this sumptuous volume will satisfy any reader who loves the sense of wonder, and the excitement of great SF.